Oil in the earth is NOT created from dead plants and dead dinosaurs. YOU have been tricked again to go to war in the Middle East for oil. The lead scientist on the study? Giora Proskurowski of the School of Oceanography at the University of Washington in Seattle ? 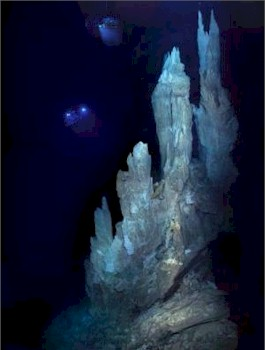 says the hydrogen-rich fluids venting at the bottom of the Atlantic Ocean in the Lost City Hydrothermal Field were produced by the abiotic synthesis of hydrocarbons in the mantle of the earth. The abiotic theory argues, in contrast, that hydrocarbons are naturally produced on a continual basis throughout the solar system, including within the mantle of the earth. The advocates believe the oil seeps up through bedrock cracks to deposit in sedimentary rock. Traditional petro-geologists, they say, have confused the rock as the originator rather than the depository of the hydrocarbons. In “Black Gold Stranglehold,” Corsi and Smith expose the fraudulent science and irresponsible politics that have been sold to American people in order to enslave them. By debunking several myths, Corsi and Smith provide an outline for progress that would help to establish America as energy-independent. The running-out-of-oil myth: The 1970s scientific study known as Hubbert’s Peak, predicting we would exhaust oil reserves by 2003, has been proven false. We are currently sitting on “more proven petroleum reserves than ever before despite the increasing rate at which we are consuming petroleum products. New and gigantic oil fields are being discovered at an increasing rate, in places the fossil fuel theory would never have been predicted as possible. The folly of oil conservation: “Black Gold Stranglehold” presents and documents how no alternative energy option has been able to provide enough energy and how each alternative has been deemed uneconomical. Oil playing a part in the illegal-immigration problem: Mexico has the third largest proven reservoirs of crude oil in the Western Hemisphere behind Venezuela and the U.S. As a result, the United States imports virtually all the oil Mexico exports. Consequently, “the U.S. government finds it difficult to take a systematic, hard look at the nearly free flow of illegal immigrants coming across our southern border. As a hedge against instability in the Middle East, the U.S. government has to calculate our oil needs when considering any steps we take regarding Mexico or illegal immigrants. In the end, “Black Gold Stranglehold” not only provides solutions, but it will empower consumers and oil industry professionals to drastically change the debate about oil. This book is sure to cause thoughtful people to reconsider the U.S. dependence on foreign oil and its effects on our economy.